It’s hard to believe as the rain hammers down on Metro Vancouver just how close the snow really is to us. I consider myself exceptionally lucky to live within driving distance of so many local attractions that truly personify the “live outside” vibe that British Columbia is known for. 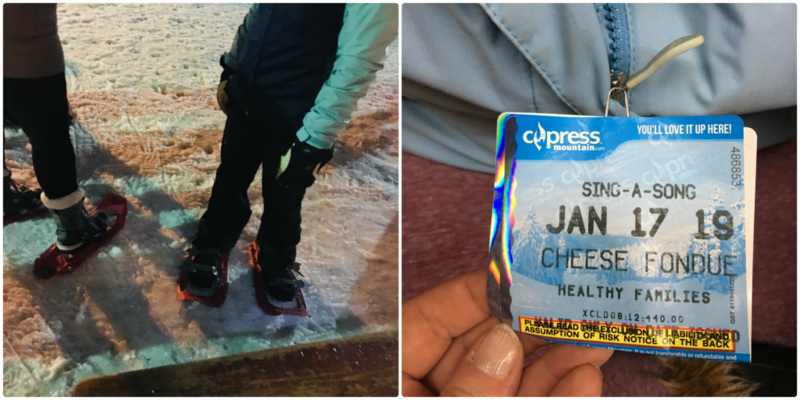 Last year we shared our first trip up to Cypress Mountain for a snowshoe fondue tour with the Healthy Family Expo team and we were invited back this year for a new, exciting tour complete with the full experience. 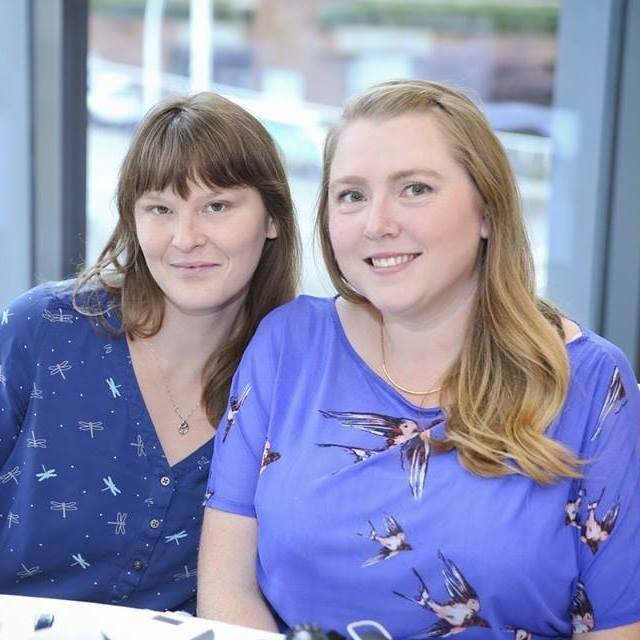 We were invited up with a crew of some of my favourite bloggers including Tamara & Jason from Discovering Parenthood, Stacey Robinsmith from Dad In The Burbs, James Smith from SocialDad and of course their lovely guests. 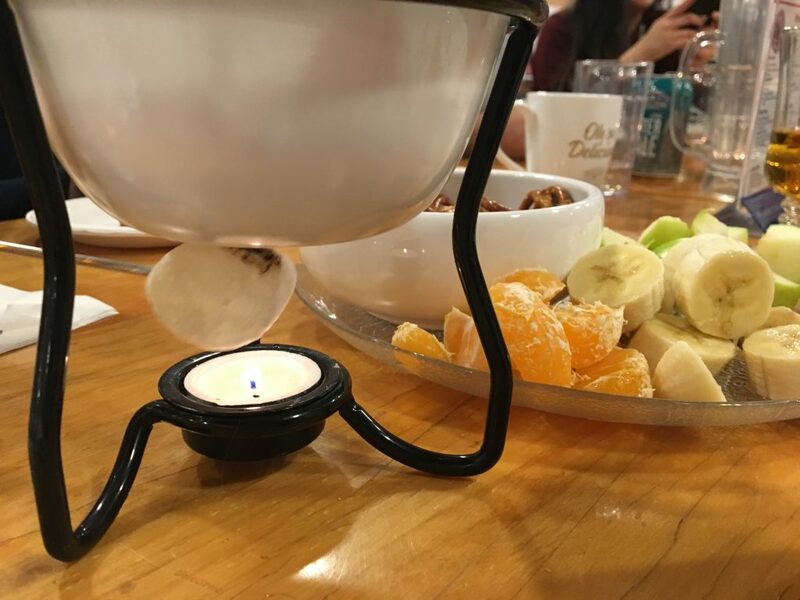 This is actually our 3rd year attending the Snowshoe Fondue tour for British Columbia Mom but the first year that Helisa and I have been able to attend together so this was a real treat for us! We both knew from previous years that you do get quite warm and given that we are having a very mild winter this year we went with less layers – in my case I went with lined water resistant pants, a 3/4 length sweater, my winter coat and a toque (which I ditched the first 10 minutes in) and Helisa went with double layered pants, a sweater and her winter coat. Remember that you can undo layers, but you’re carrying anything extra so don’t over dress. You’ll definitely want waterproof boots if possible, I went with my Bogs Arcata Lace Up Stripe Boots and they kept my feet toasty warm and dry without being super heavy. If you don’t have waterproof boots, you can ask about boot covers at the rental area. We were incredibly lucky and the start of our tour was clear skies and just the right temperature to get moving. We started our evening by checking in at the Nordic Zone where we grabbed our tags and headed over to get geared up. The snowshoe fondue tour includes your snowshoe rentals, head lamp and of course your guide. Our guide this year was Paul, one of my favourite parts of the entire tour was his commentary. 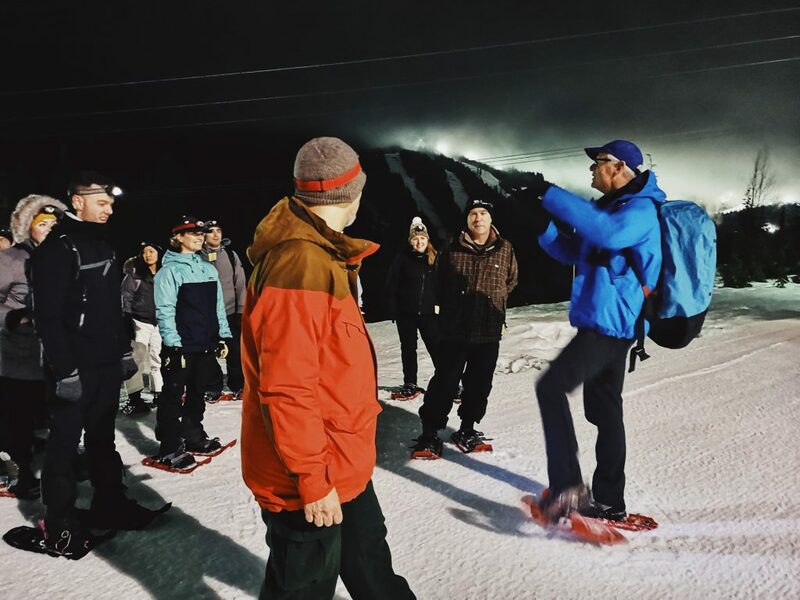 He’s been doing this for decades and is a wealth of knowledge for all things Cypress, not just the snowshoeing! Once you’re decked out for the tour, everyone gathers and you get the introduction & safety talk. 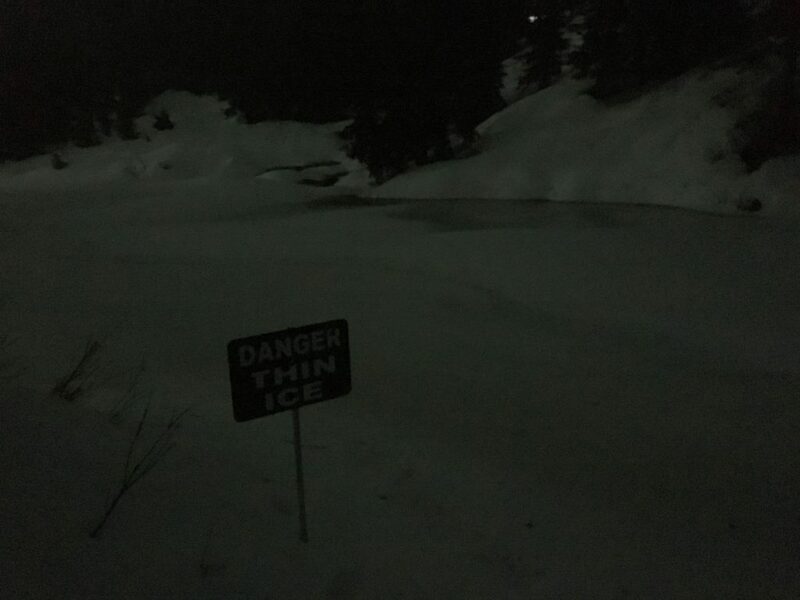 Stay with the group, be aware of your surroundings, don’t step on the cross country skiiers tracks and get ready to have fun! Paul was pretty great at keeping our group laughing throughout the tour with some jokes, stories about his many tours throughout the area and of course how we were all just trekking along for cheese. You may even be treated to a rowdy game of “Huckle Buckle” that literally had our group laughing so hard and some of us ended up on our bottoms! Last year’s tour was on a different route for me so I was excited to explore a new area, the first 5-10 minutes really get you warmed up and a few of us were huffing up that first big hill. There are different routes your guide may take depending on your groups experience, we definitely stuck more on leisurely walk route which gave us lots of time to stop for some photos and a rest if needed. They really do their best to make it an accessible experience for all fitness levels, and do ask that you give them a heads up if you have a medical condition or cold induced asthma (haiii both me and Helisa!). Along our way Paul had some perfectly timed stops ready for us to talk a bit more about Cypress, the types of trees you’ll find in the area, what to look for to avoid falling into an ice cold puddle (the snowpact is a bit low this year) and sharing a bit of his own nostalgia from previous years. These stops also included some incredible views that for a split second felt like the most grounded place I could possibly be in that moment. I took many of these little stops to breathe in the fresh air, to appreciate what was around me and to really be present in our adventure. It was lovely! Let’s be serious though, we were on this path to make our way to the cheese. 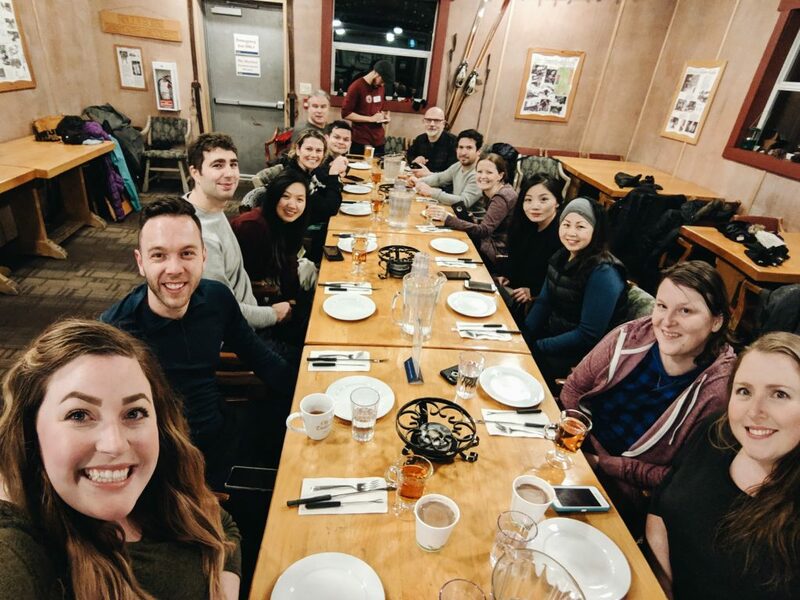 The best part of this 4 hour snowshoe tour is the fondue goodies at the Hollyburn Lodge and we were on our way! A change from last year was a bit more of an interesting way down to the lodge from one of the trails up above. Out of no where, Paul whips out a bag of ponchos from his backpack and points down the hill. We were going down folks, on our booties and you guessed it, hilarity ensued. 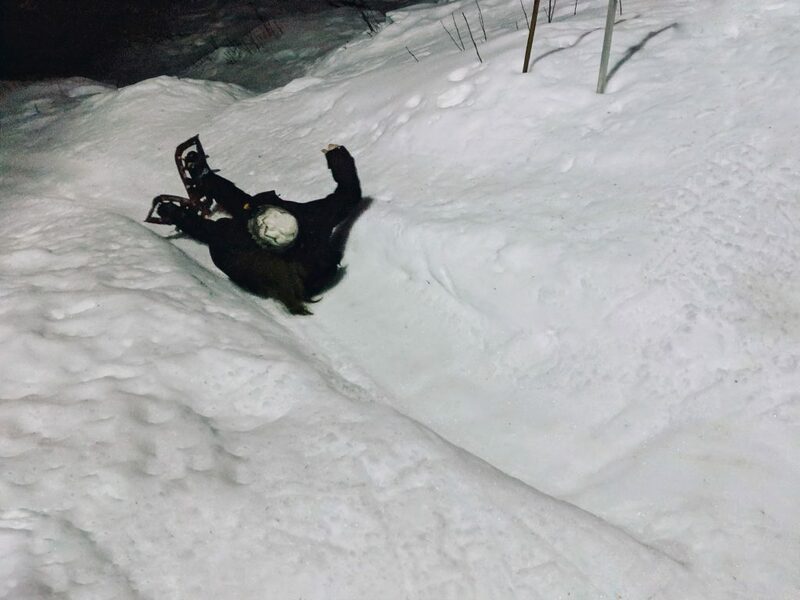 I’d love to tell you any of us did this gracefully, Kay from the Healthy Family Expo team was ready to slide all the way down to the lodge (and over a lake!) and the rest of us had no control over where we landed but we did it. I don’t think I’ve laughed that hard in a long time and it got us certainly jazzed up and excited to have finally made it to the lodge where we could warm up and dry off. 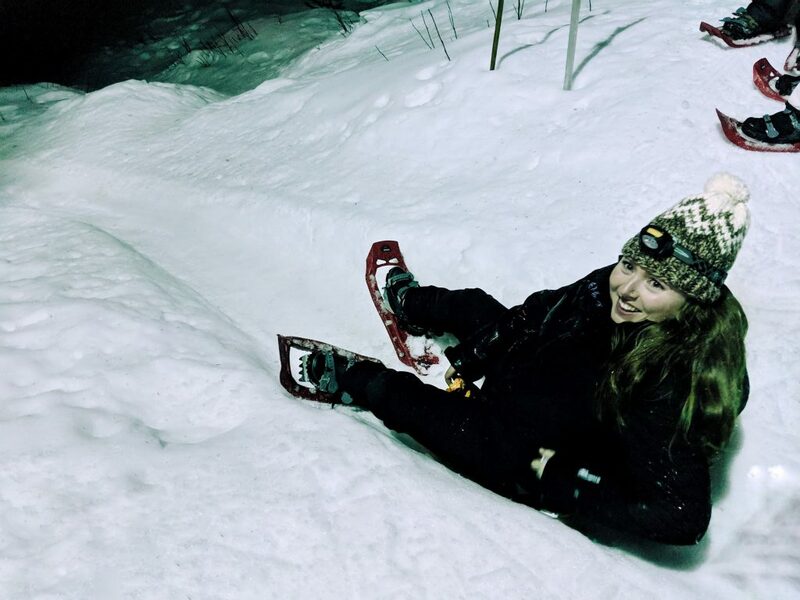 Don’t worry if sliding isn’t your idea of fun, you can walk down the embankment as well but where’s the fun in that? Just as we walked up the lodge is when the rain started so it was nice to escape it for a little bit. Once we were all safely down the hill we set our sights on one of my favourite little gems. The Hollyburn Lodge is truly an iconic piece of history for the entire Cypress area and the renewal project included incorporating a lot of historical items and clippings throughout the lodge. If you do get a chance to go, I encourage you to take some time to take in the art while you’re warming up. 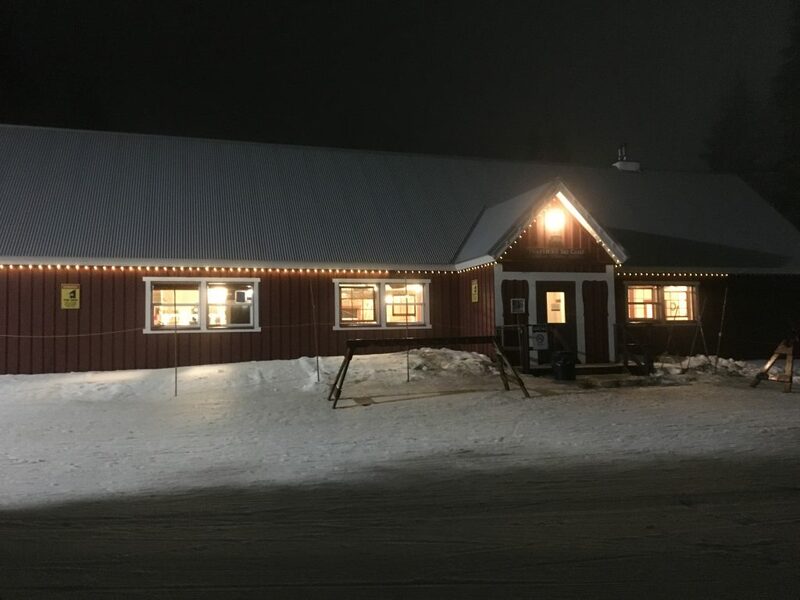 The lodge is open to anyone and has a cafe stocked with warm drinks, snacks and heartier nibbles, washrooms and plenty of seats. After your trek to the lodge, you’ll definitely have worked up an appetite like most of us have. 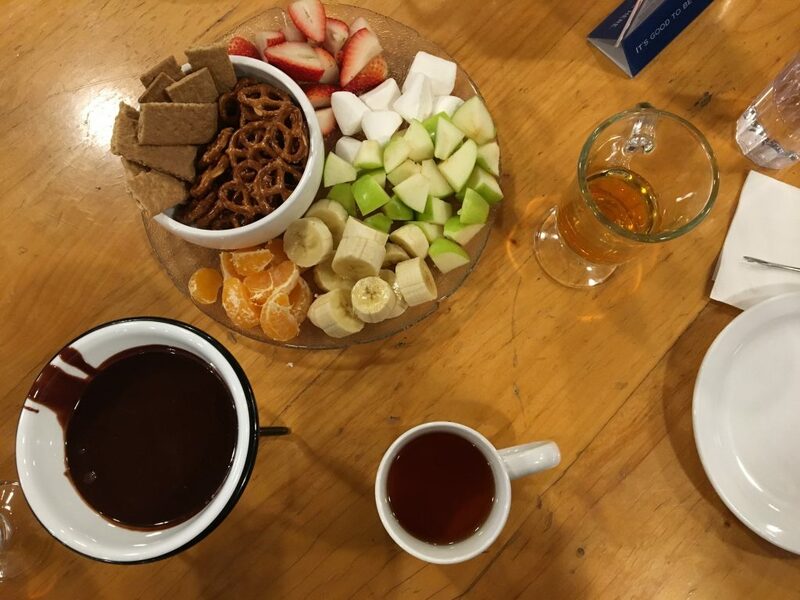 You’ll be treated to hot apple cider (it’s SO good) or hot chocolate, or if you prefer you can order an alcoholic beverage off the menu for an additional fee while the kitchen gets your fondue of amazingness ready for you. I always joke that I don’t eat dinner before these tours because the food is aplenty and often times we can’t finish it! 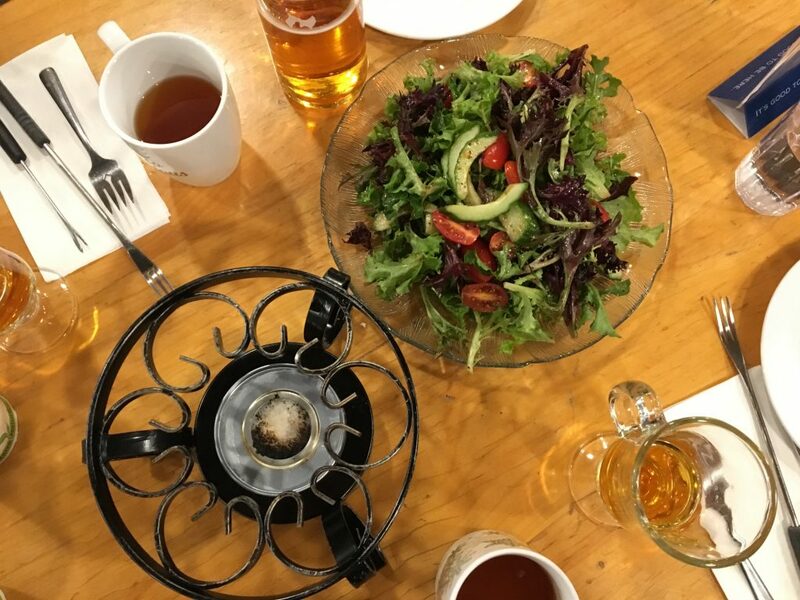 While everyone is mingling and warming up with their drinks, you’re treated to a house green salad with crispy greens and veggies and a delicious tart salad dressing. We were ravenous by this point so we were thankful for a quick nibble while waiting on the rest of the feast. 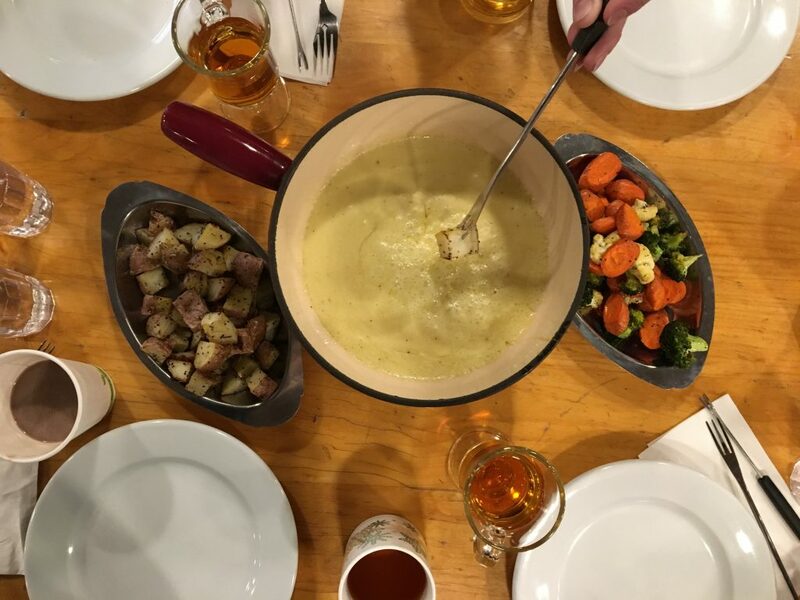 When your fondue arrives, the most delicious cheesy goodness is presented in front of you with an array of items to dip including small bites of bread, meat balls, roasted potatoes and mixed veggies. We had a pot of cheese to 4 of us and ended up with a refill so just saying, the cheese is THAT GOOD. Seriously, look at that cheese! 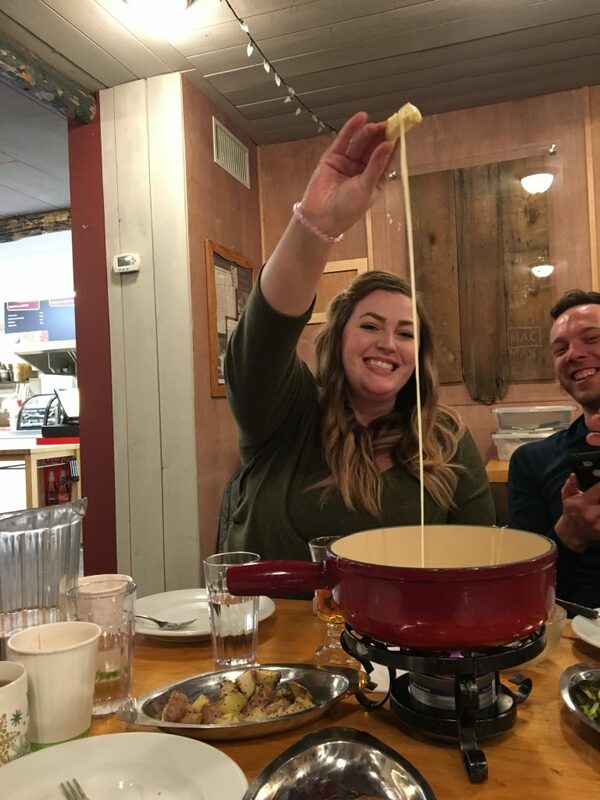 Our group was spoiled a little bit on this trip and we had the chance to sample not only the cheese fondue but also the chocolate on our trip. I honestly couldn’t pick a favourite, both were delicious and paired perfectly with each other. I encourage you to pace yourself though, you do have to walk back afterwards! Thankfully when you’re finished all your fondue, you still have a few minutes to sit and let your food settle before your guides take you back down to the “mothership” (what they call the Nordic Base Camp). By the time we were done eating the rain was hammering down to Paul graciously made the decision to take the straight route out so we could beat the downpour. 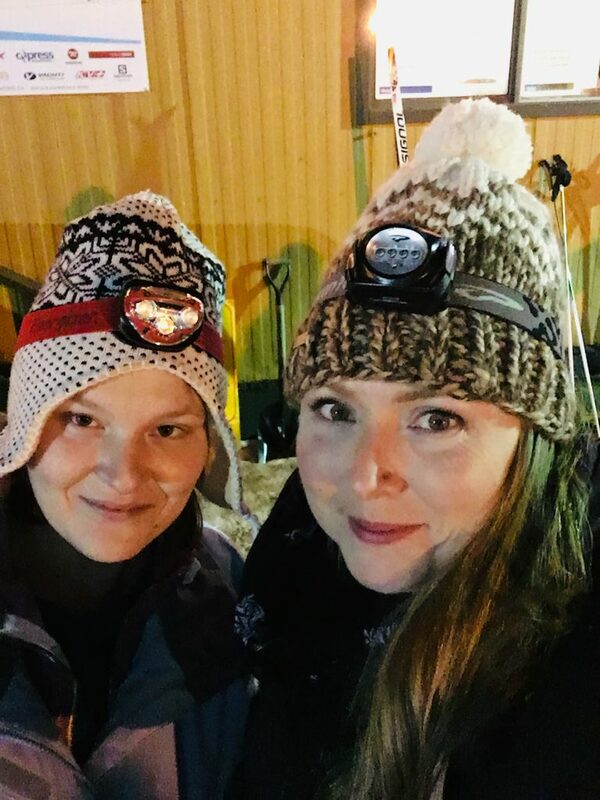 Even though it was raining and mixed with snow, we were all dressed well for it and it was still warm enough that it didn’t negatively impact our experience. We still had a great time. We made it back down the mountain safe and sound and had a great nights sleep from all of the exercise and fresh air. And of course made it home with some stories to tell and super full bellies. Definitely a highlight of our winter activities and of course something I want to do again next year. 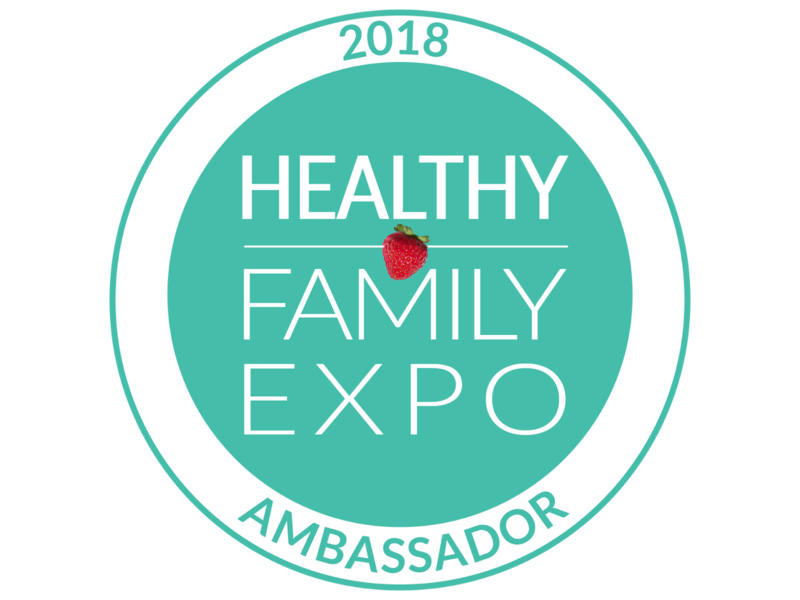 A huge thank you to the Healthy Family Expo team for inviting us along again this year and don’t forget, the Healthy Family Expo is coming back to Vancouver on March 24th, 2019! Explore 200+ exhibitors (including Cypress Mountain), taste a ton of delicious samples and let the kids run wild in the over 35,000 square foot active kids zone. Hope we’ll see you there! Just look at the joy from that cheese! 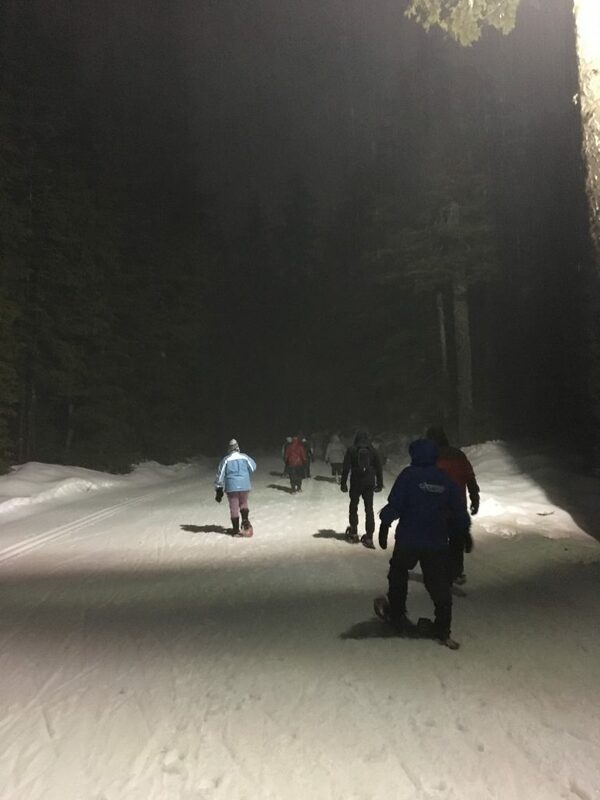 We just did a Cypress snowshoe tour and had an amazing time! I would love to do this one! Mmm…cheese!! Oh! 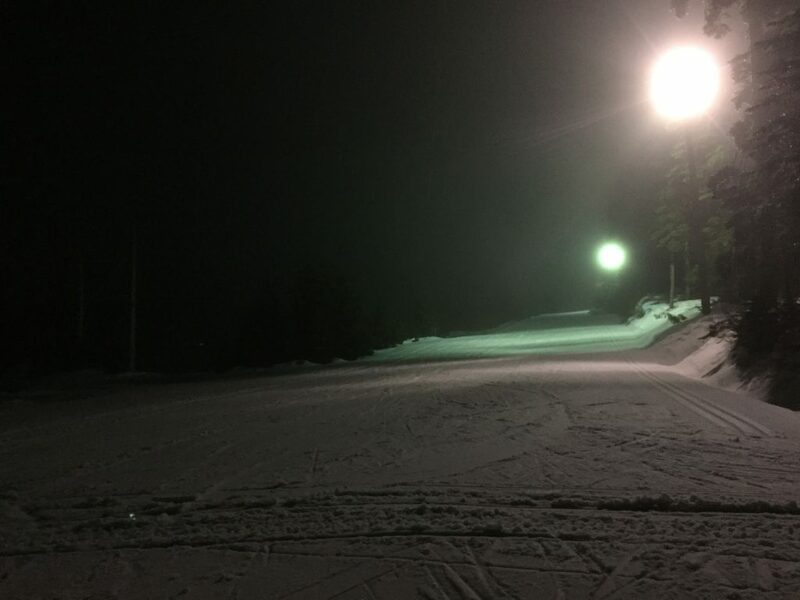 I need to do this…..snowshoes & chocolate…..and cheese! I absolutely love this! Great fun pics! It looks delicious and so much fun! What a great post and review. Great fun. I haven’t been up there yet.